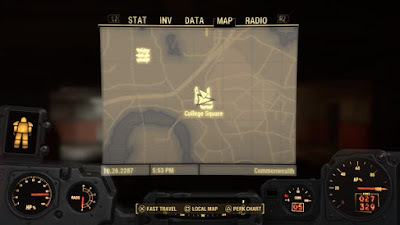 - College Square Station is located, predictably, within College Square. It’s a small intersection near Cambridge Police Station (just down the road, really) that’s teeming with Ghouls. The entrance to the Station is near the road leading northeast out of Cambridge. You can sneak in here without alerting Ghouls without too much trouble, but you need to cling to the buildings and stay low. - There’s little to nothing to see in the entrance hall beside a few dead Ghouls and an active mine near the trash cans. Take a left and down the next set of stairs, however, and that will change rather quickly: the main concourse area will have a few active Ghouls, and there will likely be at least one lurking in one of the side bathrooms. You can canvas the area for items afterward, but aside from lots of Pre-War Money in the cash registers and some chems on the shelves of one of the small stores there’s not much to see. - If you’re an Expert lockpicker, you can get behind the front desk in the concourse via a side door. This will grant you access to a computer terminal which you can hack to activate a Protectron. It will then wander around, and, more than likely, draw out and kill Ghouls for you. You’ll also find a Live & Love magazine sitting on an opened safe back here. - The path splits to the right and left at the front desk. Both lead to track level, though track level is split, forcing you to use the stairs. - If you take a left you’ll find several Ghouls on the platform below. Dispose of them as you see fit. Straight across from the platform is a side room, and inside you’ll find a more advanced Ghoul guarding assorted items, including a chest full of ammo. (If you’re performing Cleansing the Commonwealth, this is the Ghoul you’ve come to destroy.) If you search this room really thoroughly (or just look on the first desk, beside the orange tool case) you can find a College Square Station Key to open the locked door by the cash registers upstairs. - A side, green-lit room nearer to the track leads to another Protectron you can activate. Straight across the track from this room is another small room, this filled with ammo and other junk; there’s another Ghoul waiting inside. If you pass through the next accessible door on your right you can hop on the crashed train, which ultimately connects to the other side of the tracks. - Go right and you’ll find more or less the same thing on the platform as on the other side of the tracks, though there are fewer Ghouls to annoy you and they’re more spread out. Happy days. - To the left of the stairs and back a bit is a Novice locked door. There are some medical supplies inside. And, uh… aside from a Raider on the tracks with a few bits of gear, there’s… nothing else down here. You don’t need to come over here if you’re in a rush. Happy days!